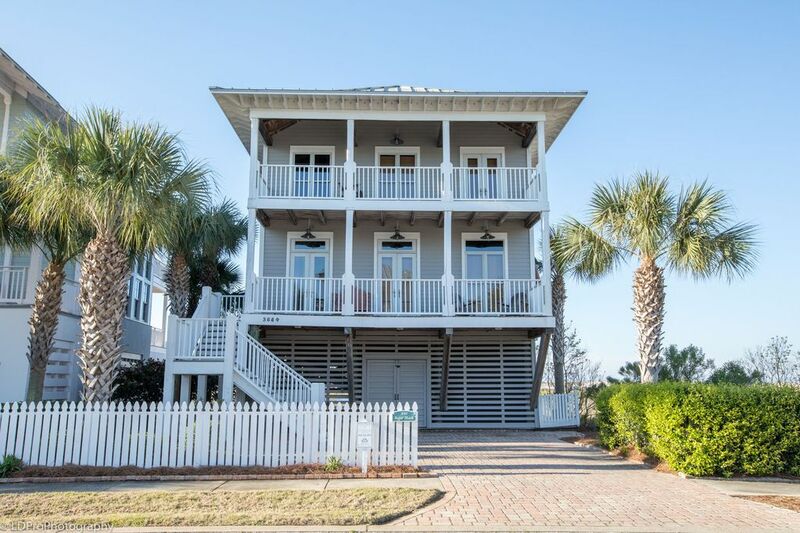 Let your mind be at ease in the sweet ocean breeze at the Sugar Shack, a unique and gorgeous four bedroom, four bathroom home in Destin Pointe. Upon entering the home you will come to the open Living Room and Kitchen. The Kitchen has a large granite island that overlooks the Living Room and Dining Area, plenty of granite counter space, and all the pots, pans, silverware, dishware, and appliances needed to prepare your favorite meal. Adjacent to the kitchen is a Dining table set for six in the Dining Area. Next comes the Living Room, which boasts two couches, two lounging chairs, a fireplace, and a flat screen HDTV. The Kitchen, Living Room, and Dining Area all share a set of French doors leading to a grand deck. This large deck has a picnic table for outside dining, as well as plenty of additional outside seating. The deck offers a panoramic view of The Gulf of Mexico, Destin's East Pass, and the lakes of Destin Pointe. The main floor is also home to a full bathroom one of the Guest Bedrooms. The Guest Bedroom on the main floor has a Queen Bed and private access to the front porch and entrance of the home. Traverse up the stairs to the second floor of the home and you will find three additional bedrooms. The first bedroom you will come to on the second floor is the second Guest Bedroom. It comes with a Queen bed, a connected bathroom with a walk in shower, and French doors leading to a large private balcony. The Private balcony has a wooden swing attached to its ceiling and offers a stunning view of the Destin Bridge. The other two bedrooms on the second floor are both Master Bedrooms. The first Master Bedroom has a King Bed, a flat screen HDTV, and a DVD player. The adjoining Master Bathroom has a walk in shower. The second Master Bedroom has a King Bed and a TV. Its adjoining Master Bathroom has a bathtub/shower combination. Both of these Master Bedrooms share a deck that's home to arguably the best views of the house. The deck has two swings and two rocking chairs, along with a panoramic view of The East Pass, The Gulf of Mexico, and one of Destin Pointe's Lakes. This home sleeps eight guests without the need of a Sofa Sleeper. Amenities include a washer and dryer room with full size washer and dryers, a storage area under the home for beach essentials, wireless internet access, and complimentary beach service (while in season). Everything in this home is of a timeless quality, including its views. Book this home today and come see why so many repeat guests have found their home away from home in the Sugar Shack. What a great time we had at the The Sugar Shack! Rooms were spacious, beds were comfortable, kitchen had everything we needed to cook a couple of big meals. Location was perfect for my large family! The walk to the beach was easy and even got easier once we learned about the tram. I enjoyed getting up early and setting on the back deck so I could watch the birds as they flew around the lagoon and then enjoyed it again after dark as I listened to the frogs singing. My overall experience couldn’t have been better. Thank you Sugar Shake, you made this week extremely special for my family. Hope come back again next year!! Great end to the summer! This is our second time staying at Sugar Shack. It is a beautiful home and everything turned out wonderful! We stayed in the Sugar Shack for Easter 2015 and we can't wait for the opportunity to rent it again. From the moment you walk in, room after room, is decorated so beautifully. The ceilings are high and the light is fantastic. There are porches everywhere but the porch off the living room has the most amazing views of the water and sunset. A 3 min. walk over the walkway and you are at the most beautiful sandy beaches. There is a grocery and Target 1 mile away and it's easy to drive out for what you need and get back to paradise quickly to get to the beach. Whenever we talk about a rental, the Sugar Shack is always at the top of our mind..."it would be great if we could find a house like the Sugar Shack we rented in Destin..." My husband said if he built a house in Florida it would be modeled after this one. You can't go wrong with this house.